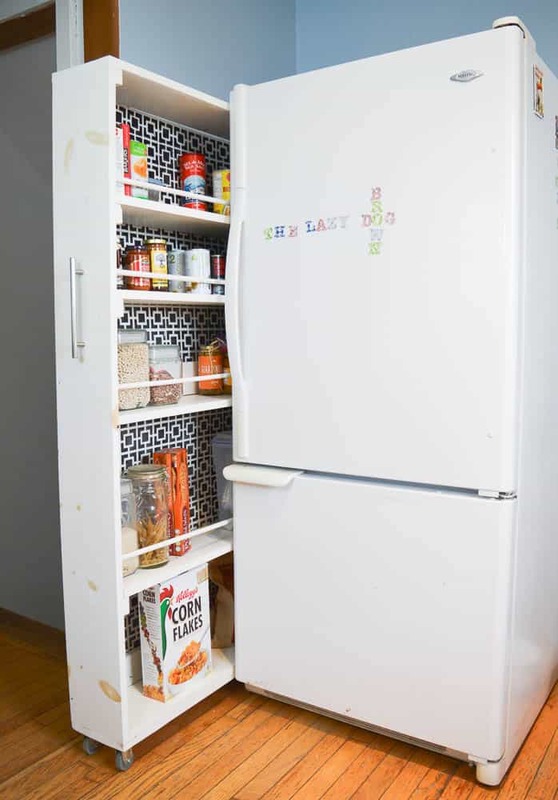 Inside: A tutorial for how to build a solid pull out pantry that fits in the space beside your fridge! 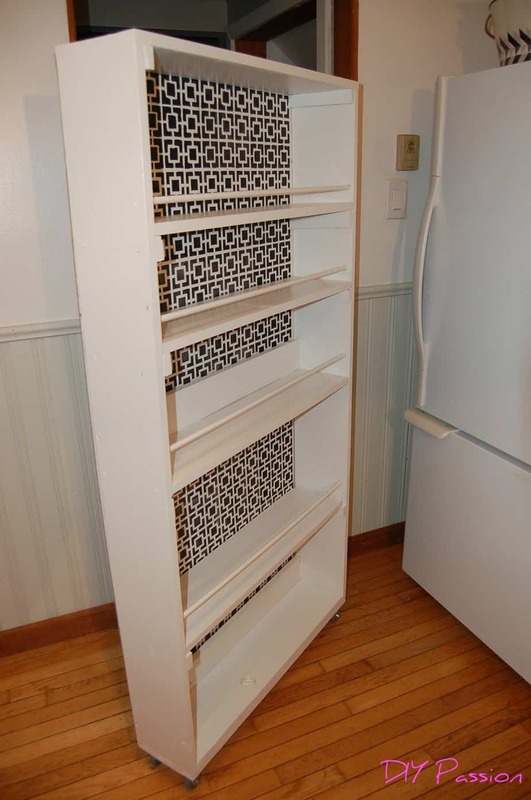 This rolling cupboard will save you space and holds more than just a spice rack. After planning our kitchen revamp, we decided we wanted a pantry to use all the space beside the refrigerator. We first thought we’d purchase one from Ikea – but after careful measuring, we realized it was going to be 3″ too big. The ones offered from box stores were all too wide by a long shot. So we decided on a small space storage solution! 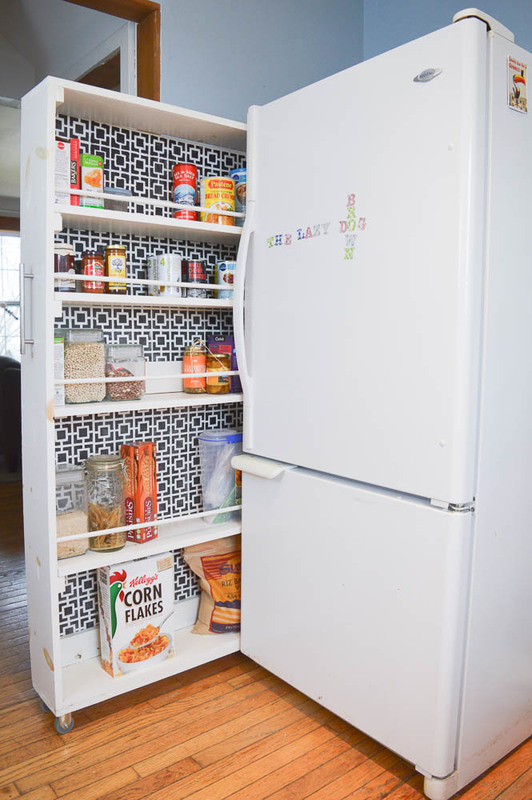 Today, I’m sharing how we built a DIY Pull Out Pantry. 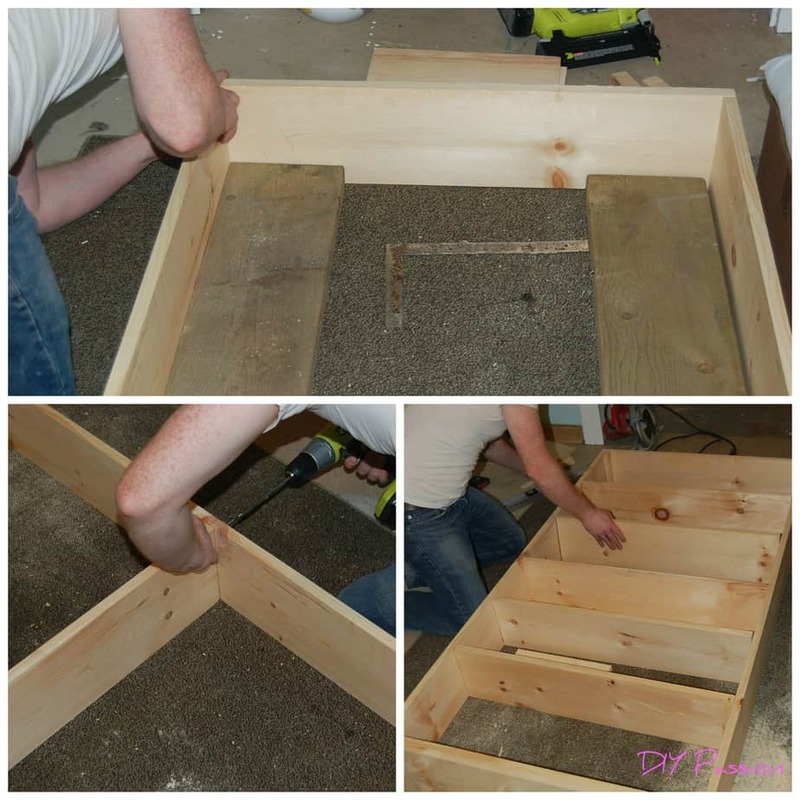 These plans can easily be adapted to be smaller for a below counter spice rack or rolling pantry cabinet depending on your space. While you’re here, I’m assuming you are a small space dweller like we are, you might also want to check out how I keep my kitchen decluttered, my best tips for organizing a small linen cupboard and also how we live with our small kitchen without renovating! nail gun – WE LOVE this one! 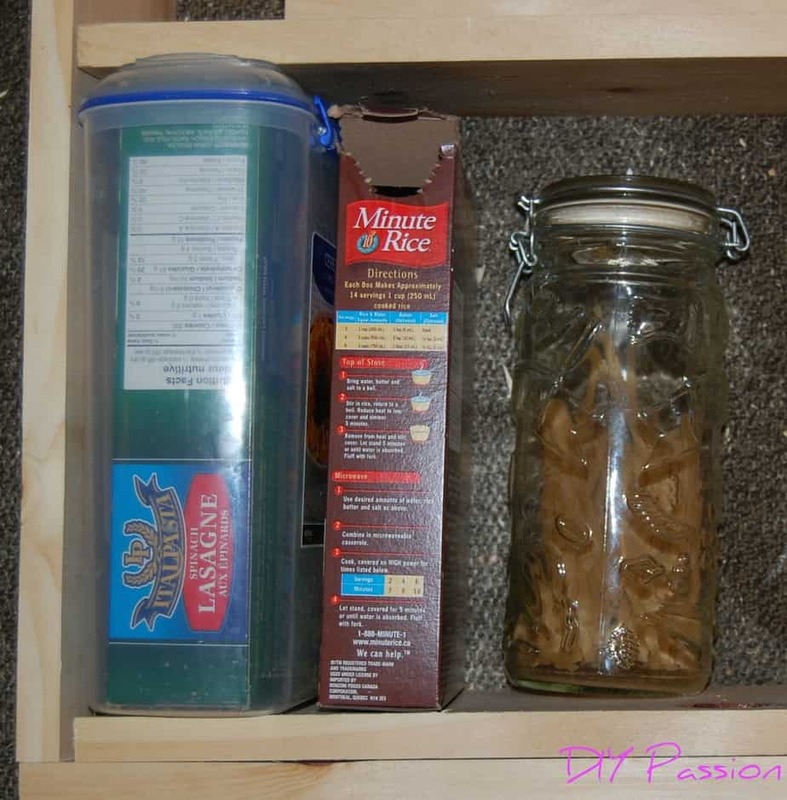 Well, we researched and found a post for a canned food organizer shelf by Classy Clutter. We decided to modify the plans to make it bigger and able to hold more things. “I want a pantry that Holds ALL THE THINGS!” It doesn’t do THAT, but it holds almost everything that was previously in our upper cabinets. 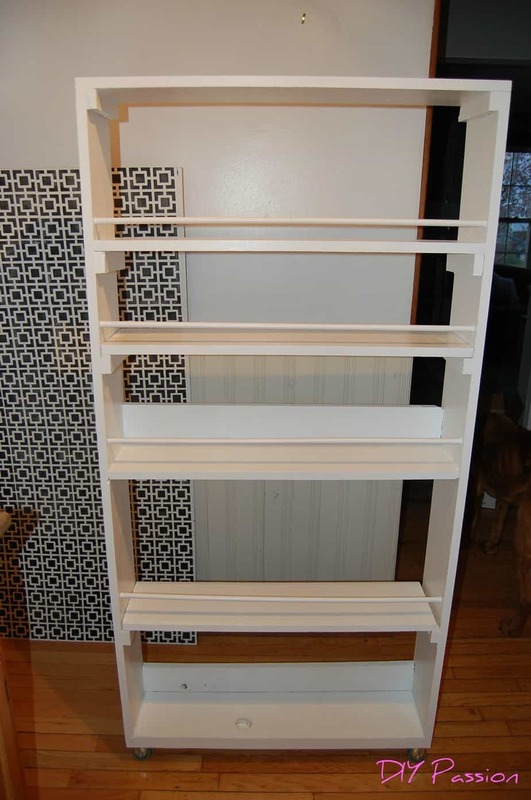 This free-standing unit is ideal for small space dwellers or renters. The beautiful part is that the entire thing cost us less than $140 to build and IT’S PRACTICALLY THE BEST THING EVER. We wanted it to be roughly the same height and depth as the fridge once all was said and done, so I first drew up plans to determine just how much wood we’d need. Having the plans made building quite straightforward. I simply measured and cut the pine planks for the frame, then measured and cut the shelves. 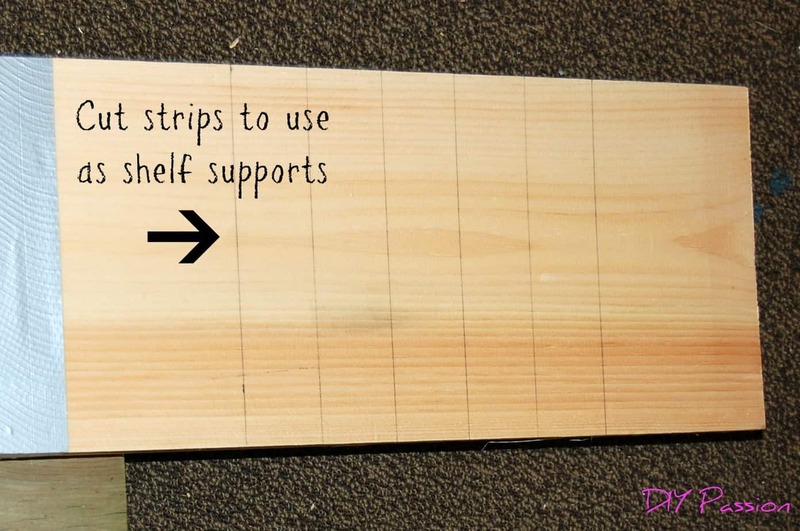 With some excess I had left, I cut a bunch of ‘strips’ from the planks, knowing that I’d later need shelf supports. Using a square, I built the frame of the pantry. 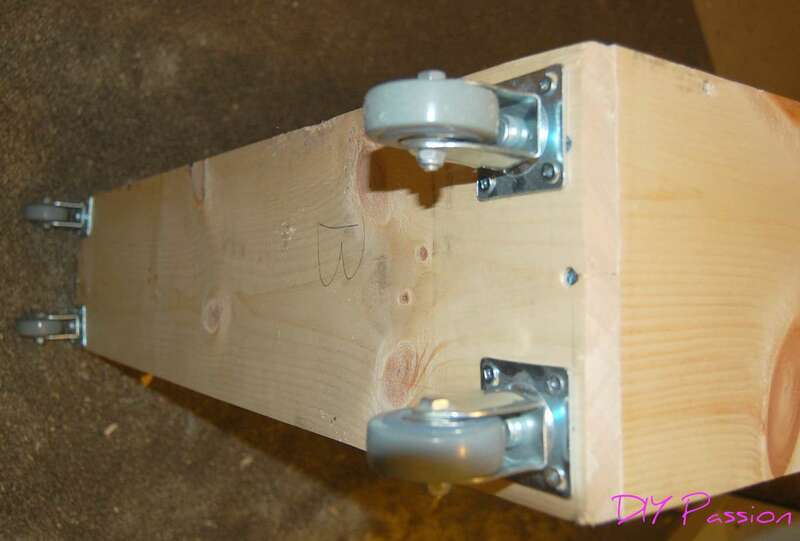 I affixed everything together using wood glue and wood screws. Sure, nails would have been less visible, but ultimately, much less strong. We wanted this pantry to hold ALL THE THINGS. Taking a cue from Classy Clutter, I doubled up the bottom shelf for reasons I’ll explain later. Then I simply measured and marked where we wanted each shelf. 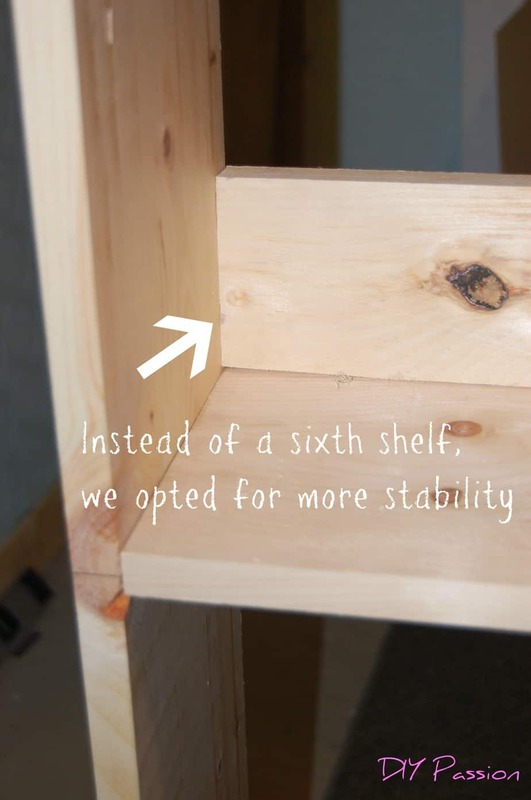 The small strips mentioned above were glued and screwed below each marking at either side of the inner frame, so that the shelves could simply rest on them. The middle shelf was screwed in and secured further with nails. The others (at this point) are just resting on the supports and are removable. We determined the height of the shelves based on the size of our storage canisters, and typical food stuffs. We knew the bottom shelf would be used for the tallest items. Initially, we were going to have six shelves, but settled on five – given that let us store these taller things. So, with the sixth shelf I had already cut, I made a rip cut (lengthwise cut) with the circular saw and used it as an extra support brace for the middle and bottom shelves. (Erin here!) While Dan was doing all that building, I was crouched on the floor stencilling the white side of the Masonite for the back part of the pantry. We chose Masonite to keep the unit as light as possible. We had it cut to size at the hardware store. Once the shelves were in place, I marked where I wanted the dowels to go. We decided against a dowel on the very bottom shelf, because we knew we’d likely store cereal boxes there and there was little danger of something falling off and injuring someone. I marked where I wanted the dowel, used a level to make sure it was straight, and with a large drill bit (the same size as the dowel) made a hole on either end of the frame. We decided to make our dowels go ‘through and through’ so that we can remove them for easy cleaning access. I added our four casters to the bottom using wood screws. Here’s where that doubled up bottom comes into play. Had I not layered a second plank on the bottom of the frame, the caster screws would have been too long. Before painting, I went back and filled all the nail holes and wood holes with paintable wood filler. I also ran a bead of caulking down the sides of the very bottom shelf to prevent crumbs from getting forever stuck down there. Then the whole thing got a light sanding. Next, together we primed the wood with stain blocking primer and painted the wood with latex paint in a hue to match our kitchen cabinets. (You can see our finished kitchen here). The long drawer pull was added to the front so that it can be pulled in and out with ease. Then, the new pantry was loaded up! It holds TONS of stuff. We freed up a boat load of space in our cupboards for dishes and serving ware. A word on safety – there is still the potential for ‘tipping’. Ours is completely held in place by the wall and the fridge. Due to its size, it’s actually quite difficult (and uncomfortable) to pull it out beyond that point. We are confident that it is completely secure. BUT – you could go the extra step and put some sort of rubber stopper on the ground to make sure it doesn’t get pulled out too far. We are IN LOVE with this project. It was fairly straightforward to do. And it gave us space to store (almost) ALL THE THINGS!! If you really want to take advantage of vertical space, why not build your own DIY hanging mug rack? 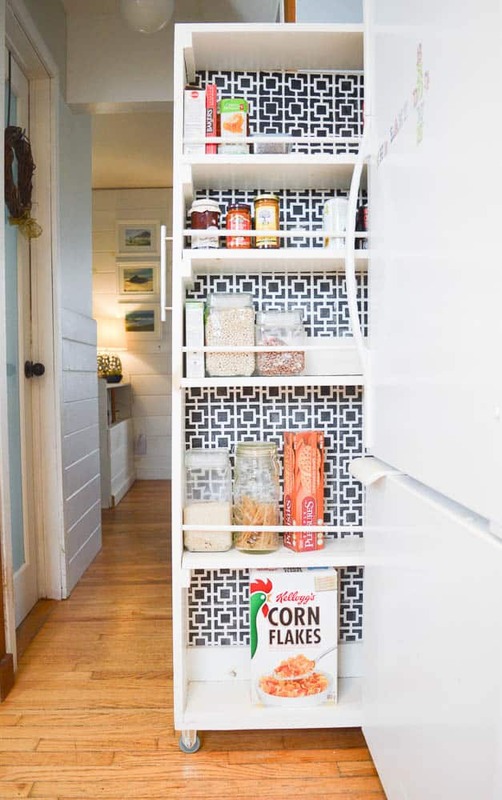 I can’t even handle the cuteness of these pantry organization labels from The Country Chic Cottage!! This post may contain affiliate links – to see our full disclosure policy, click here. What is the cost of the raw materials?